Within a week, I am facing a deadline to submit the manuscript for the upcoming fourth edition of Moon Handbooks Patagonia, and that will be cutting it close. That means limited time to devote to this blog but, since I finally made it onto Navimag’s new vessel M/N Edén (pictured above), I’ll make a few brief observations on the ship and the voyage. In one sense, this was the least enjoyable voyage I’ve ever done with Navimag, and that had to do with the weather – I’ve been extraordinarily lucky to enjoy clear skies almost every time, but shortly after we sailed from Puerto Natales it became overcast, and it never really cleared until we were approaching Chiloé and Puerto Montt. 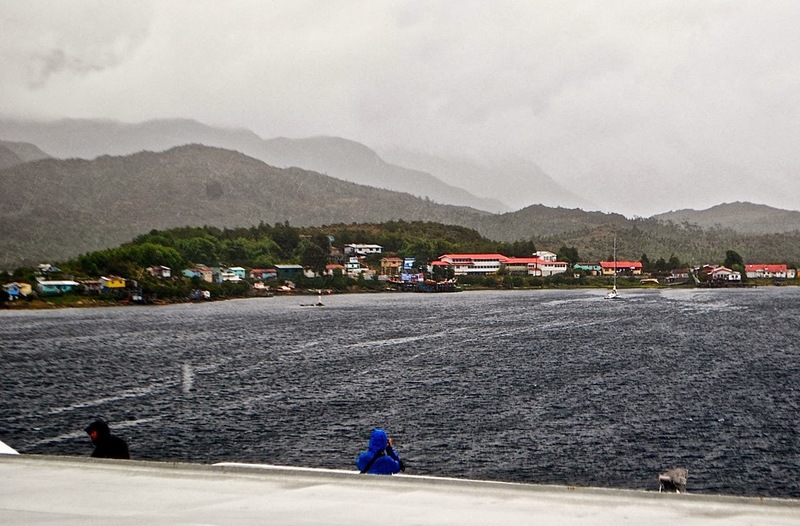 Through the most scenic part of Chile’s Pacific fjords, between Natales and the isolated village of Puerto Edén (pictured above), visibility was mostly poor. Still, having seen the area many times before, I was less disappointed than the other passengers. Some brief words on the ship: Pressed into service for the remainder of this summer, after being acquired from Mexico’s Baja Ferries, the former Monte Cinto is a worn but seaworthy vessel whose freight capacity is greater than its predecessor the Evangelistas. On the down side, its passenger capacity is probably less than half the Evangelistas’ 300 or so, but there's plenty of sightseeing room on the bow when the weather clears. I personally found the Edén comfortable enough, but I expect the company will spend some time and money making it shipshape this winter. Among other things, ideally, this will include enlarging the cafeteria at the expense of the current audiovisual salon, with reclining seats, that hardly anybody bothered with. At a later date, after my book deadline, I’ll write a more detailed report. 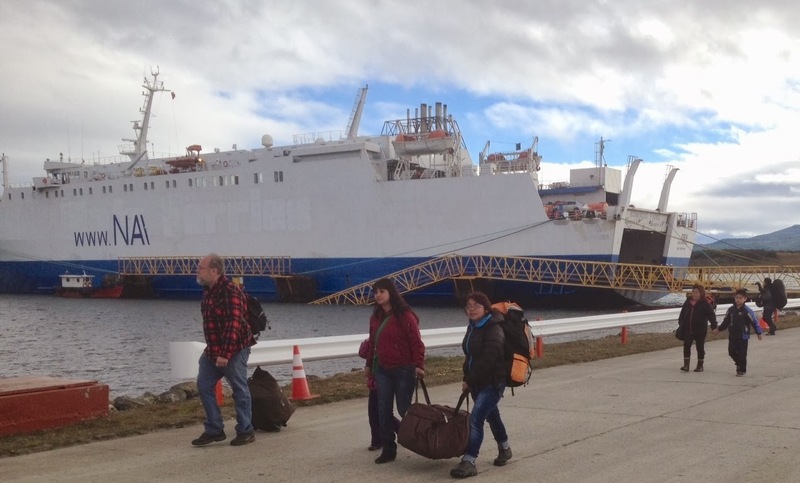 This afternoon, Navimag’s new but long-awaited ferry Edén docked at Puerto Natales on its maiden voyage from Puerto Montt, and I was there for its arrival. 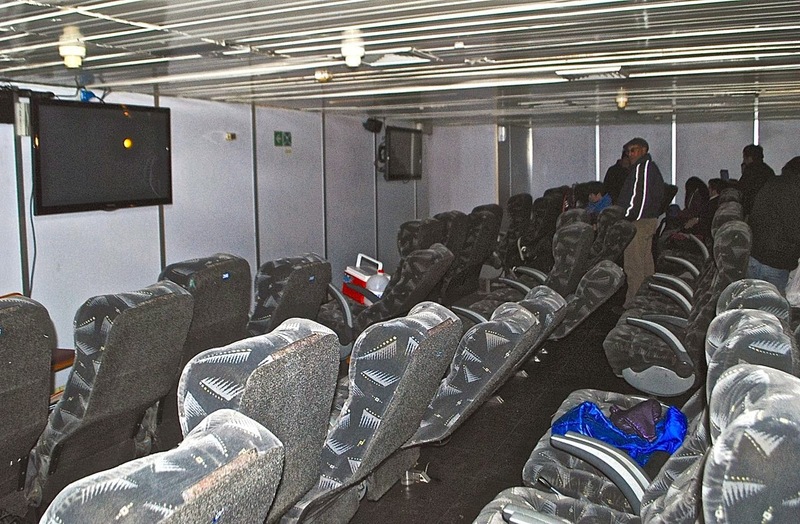 Though when I spoke with Navimag’s Santiago office last week, it was unclear whether this first voyage would simply be a cargo-only trial run or carry passengers – the demand has been pent up all summer – it did indeed carry passengers. 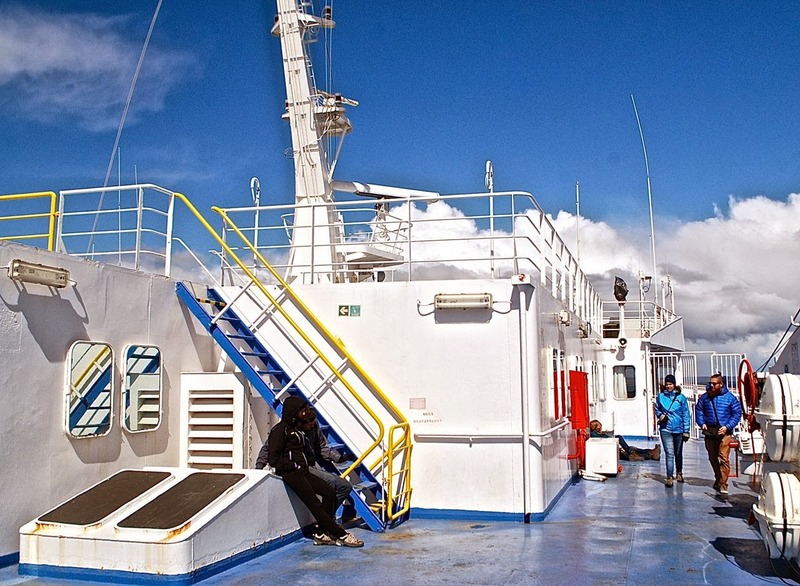 This morning, when I went to Navimag’s dockside office in Natales, people were starting to line up for tickets, and the return voyage will sail tomorrow at 4 pm, arriving in Puerto Montt Friday morning. Though the ship arrived at 4 pm, it was a couple more hours before the passengers disembarked because some cargo had to be unloaded first, and it was also a political event – because Navimag is so important to the tourist trade and other commerce, the regional governor (appointed from Santiago) and the local mayor were both there to greet the vessel. In fact, some of the passengers told me, he made a point of speaking to them. For what it’s worth, they also told me they enjoyed the trip immensely. I’m looking forward to the return voyage as a change of pace. Over the last several days, I drove Ruta Nacional 40 – whose southern Patagonian segment qualifies as Argentina’s loneliest road – southbound from the town of Perito Moreno to El Chaltén, El Calafate and the Chilean border for the first time (I’ve driven it northbound many times). Tomorrow, I’ll be taking the ferry northbound for the first time, though I took the previous vessel Evangelistas southbound many times. Three years ago, I was scheduled for the northbound trip, but the Evangelistas struck a rock on the way south, the trip was cancelled, and I ended up driving back via Argentina’s coastal Ruta Nacional 3. Oddly, the new vessel’s exterior does not conform to Navimag’s traditional color scheme of red and white, with touches of yellow and sea blue. Rather, it’s a white-and-blue paint job that, if I didn’t know better, I might mistake for the colors of the Argentine flag – celeste (sky-blue) and white. There are other signs of early deployment as well – on the portside, they’ve barely begun to paint the company name, and there remains the former company’s faint trademark – in a previous incarnation, the Edén crossed the Gulf of Mexico from La Paz to Topolobampo for Baja Ferries. It started its working life as the Monte Cinto, linking the port Marseille to France's Mediterranean island of Corsica. 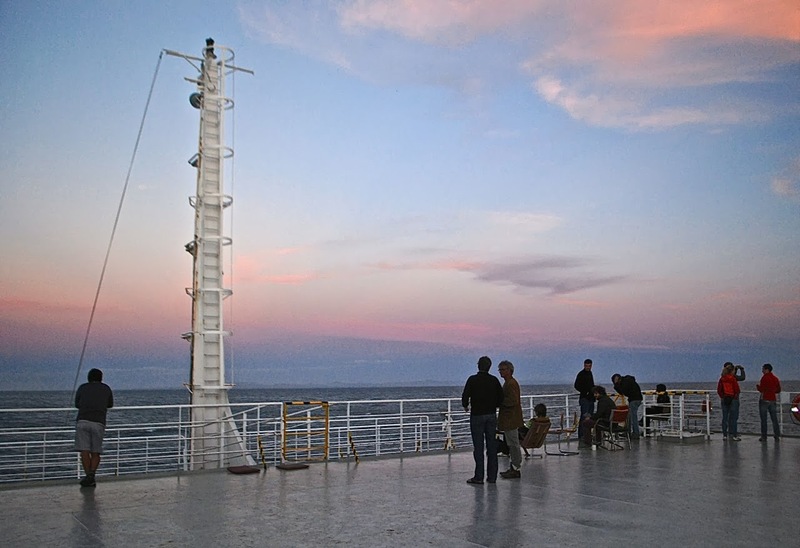 Over the next few days, I’ll get to know the new ship and, even though I’ll spend much of the time writing as a book deadline approaches, I’ll enjoy the slower pace of travel at sea. And I'll promise to try to avoid using the same lame pun about "ferry tales" again. It’s been a long time coming, but I finally got the slightly more than tentative word that, starting next Friday, Navimag will resume its weekly ferry shuttle between Puerto Montt (whose terminal building appears in the photograph above) and Puerto Natales. 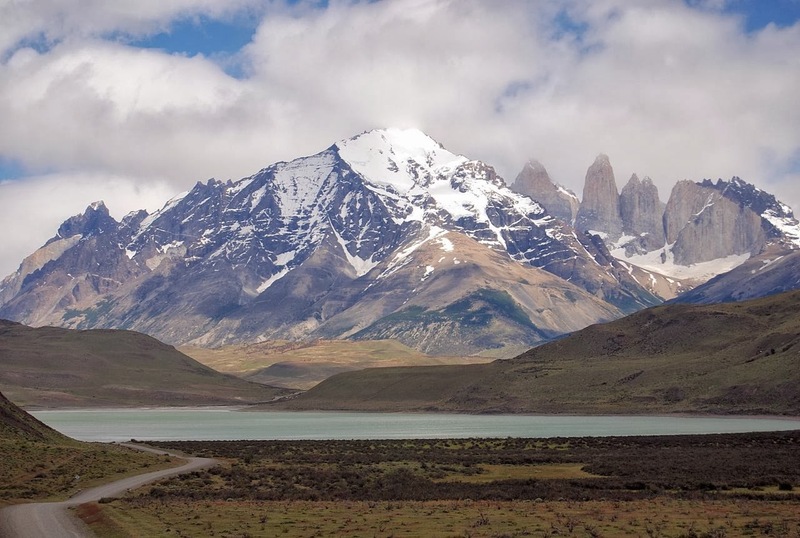 One of this summer’s biggest disappointments has been the lack of a suitable replacement for the former Evangelistas, which used to carry upwards of 300 passengers on this popular route, where Natales is the gateway to the southern Andean grandeur of Torres del Paine (pictured below). 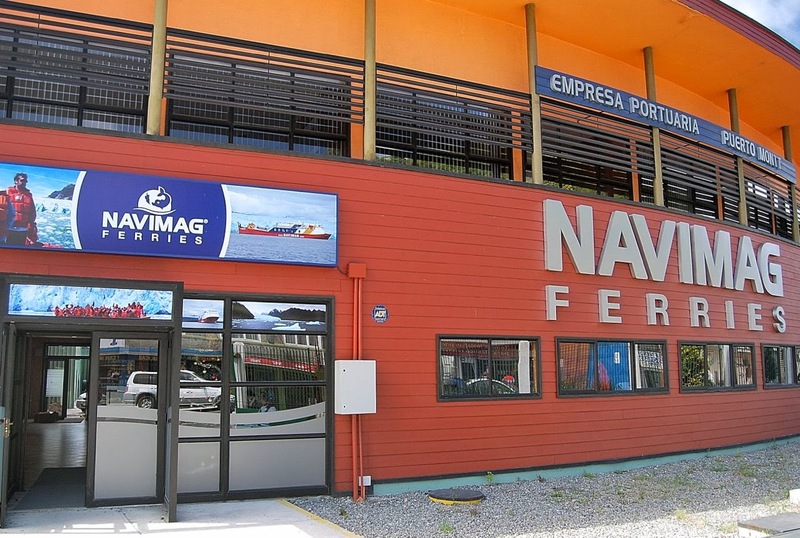 Navimag's new vessel Edén, a reconditioned passenger and vehicle ferry that formerly connected the Baja California peninsula with the Mexican mainland, will have a smaller passenger capacity than the Evangelistas, but at least it will make matters more predictable. I was particularly pleased because it means that, on the 18th, I should be able to sail back to Puerto Montt rather than make the long drive back via Argentina. The information is not yet up on Navimag’s website, and there could still be a glitch, but I’m reasonably confident that things will go according to schedule. My sources in Navimag’s Santiago headquarters told me the vessel had set sail from Valparaíso, so it should arrive in Puerto Montt well ahead of Friday’s scheduled departure. Skiing the Carretera Austral? In Summer? Over the past week, as I’ve proceeded south on Chile’s Carretera Austral, I’ve seen many cyclists on what is one of most scenic routes in the Americas – a decade ago, it was still a little unusual but, as the highway has gained notoriety, I’ve seen dozens or more every day. Leaving the town of La Junta, though, I spotted something so unusual that, at first, I thought I might have been hallucinating: on a rise ahead of me, there appeared to be an upright human figure waving his arms in the middle of the route as he advanced south. If I hadn’t known better, I would have thought it was a skier and, as I overtook him, I was surprised to see that my guess was correct, in a way. 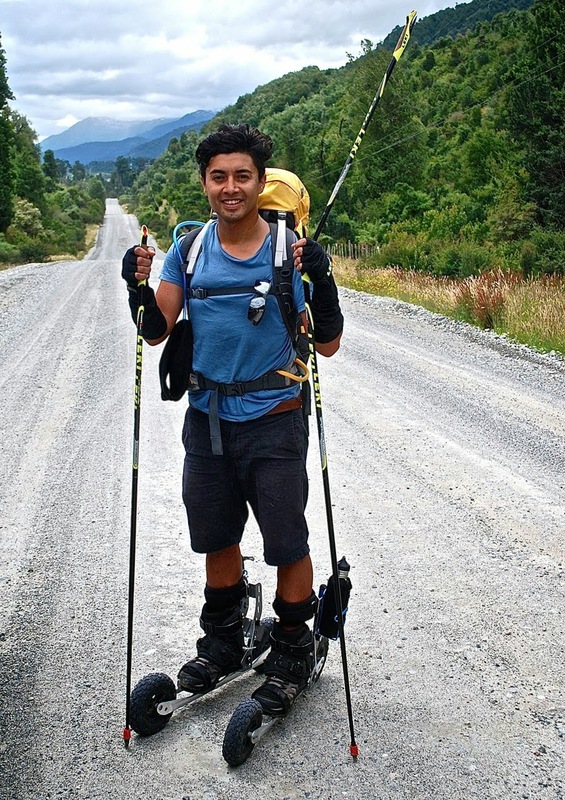 Pulling off onto the roadside and engaging him in conversation, I learned it was a young man from Viña del Mar wearing wheeled “skis” as he attempts to travel the road from Chaitén (about 150 km north) to Villa O’Higgins (another 840 km south). In effect, it’s cross-country skiing without the snow, fairly easy when the road is smooth but more difficult when there’s loose gravel (as there so often is). Traveling by car, I doubt I’ll see him again, but everybody else on the highway should keep an eye out for him and, if you should see him, please let me know. Meanwhile, I did manage to spend a night in volcano-ravaged Chaitén for the first time since late 2010, when the ash-clogged town was a mess. 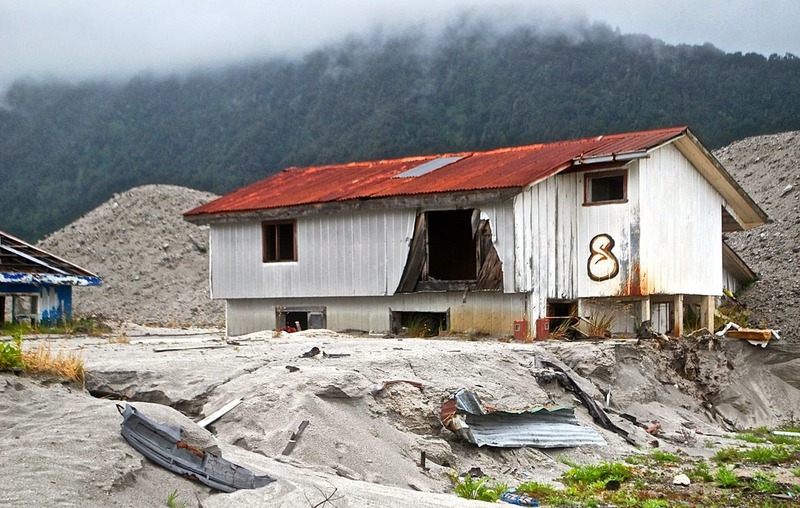 While there’s still some evidence of that, as the photograph above suggests, most of the town shows signs of revival, though the population is certainly less than half the 4,000 it was before the eruption and evacuation. 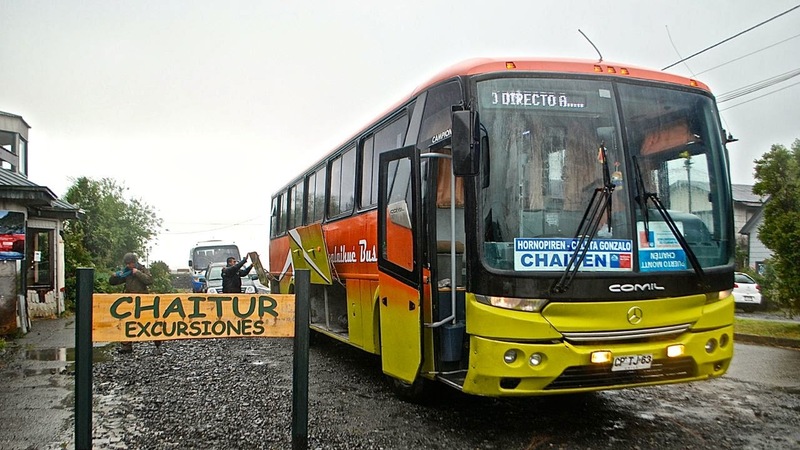 There is now daily subsidized bus service to and from Puerto Montt via Caleta Gonzalo and Hornopirén that includes two ferry connections. Southbound connectivity, though, is not nearly so good. There are daily buses (also subsidized) to the white-water Mecca of Futaleufú, but only three per week southbound to Coyhaique (where I arrived yesterday afternoon by car). That accounts, in part at least, for the number of hitchhikers along the road. As I proceed south, the pavement is advancing between Puerto Cárdenas and the turnoff to Puerto Cisnes, a distance of some 200 km, and there are frequent stops for construction.. Beyond Cisnes, there’s smooth two-lane blacktop all the way to Coyhaique (where I arrived yesterday afternoon). After a couple days here, I look forward toward continuing south but, as I understand it, floods along the Río Baker have blocked the highway so that it’s presently impossible to reach Caleta Tortel and Villa O’Higgins overland from the town of Cochrane. This wouldn’t be the first time that rain and flooding slowed or stopped my progress on this memorable route.